In general, a pronoun is a word that refers to either the people talking (I, me, you) or someone or something that is being talked about (he, she, it, them, this). Gender pronouns (he, him, his, she, her, hers, them, their) specifically refer to people that you are talking about. Traditionally, these gender pronouns are matched with people accordingly: Men/males are referred to by "he/him/his" and women/females are referred to by "she/her/hers." Sometimes, however, a person whose gender is fluid may prefer an opposite pronoun. In such cases a man/male may prefer "she/her/hers" and a woman/female may prefer "he/him/his." These are called preferred gender pronouns (PGP). Some people may choose to use pronouns that are neither masculine or feminine. In such cases a person may prefer the singular they by using "them/they/their." Or they may prefer "ze/zem/zir." 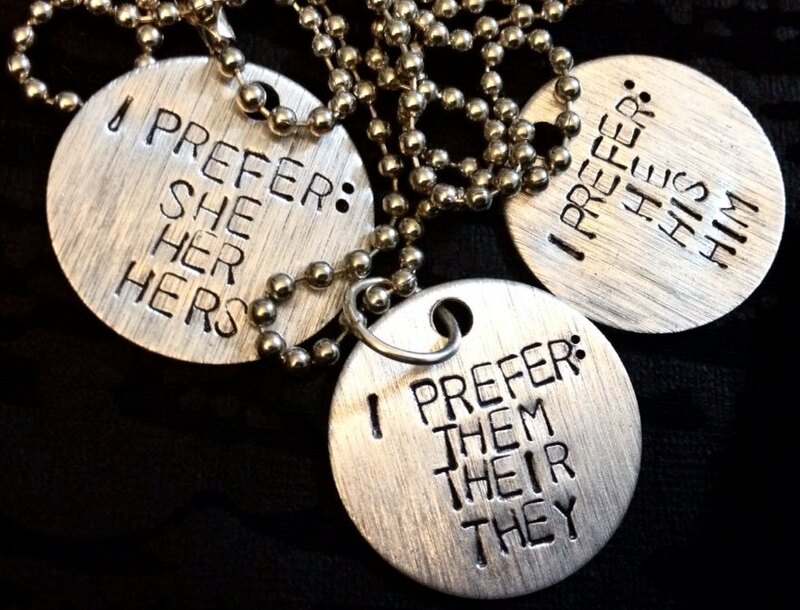 These are called gender neutral pronouns (or gender inclusive pronouns). They are used to show respect to individuals and groups whose gender identity is non-binary, non-conforming, or fluid. A preferred gender pronoun (PGP) is the pronoun that a person considers to be the correct pronoun and chooses to use for himself/herself/themself. For example: If Linda's preferred pronouns are she/her/hers, you could say "Linda ate her food because she was hungry." Or if Linda's preferred pronouns are them/they/their, you could say "Linda ate their food because they was hungry." 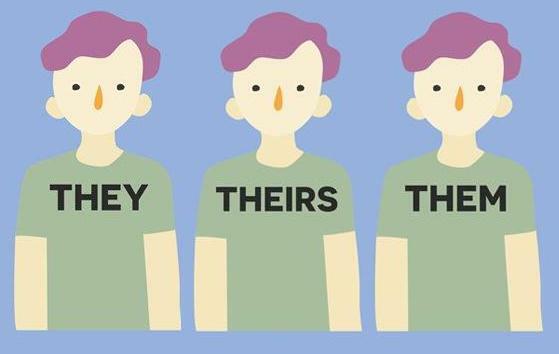 "She, her, hers" and "he, him, his" are the most commonly used pronouns. Some people call these female/feminine and male/masculine pronouns. But many avoid these labels because, for example, not everyone who uses "he" feels like a male or masculine. And not everyone who uses "she" feels like a female or feminine. A gender-neutral pronoun or gender-inclusive pronoun is one that gives no implications about gender, and could be used for someone of any gender. 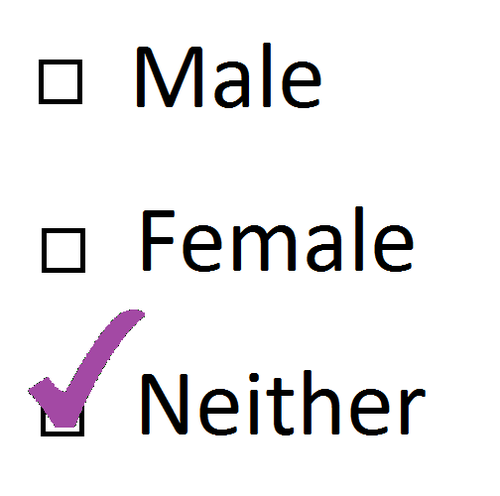 People with non-binary gender identities often choose new or unique third-person pronouns for themselves as part of their transition. They often choose gender-neutral pronouns so that others won't see them as female or male. Examples include: "them/they/their" or "ze/zem/zir." 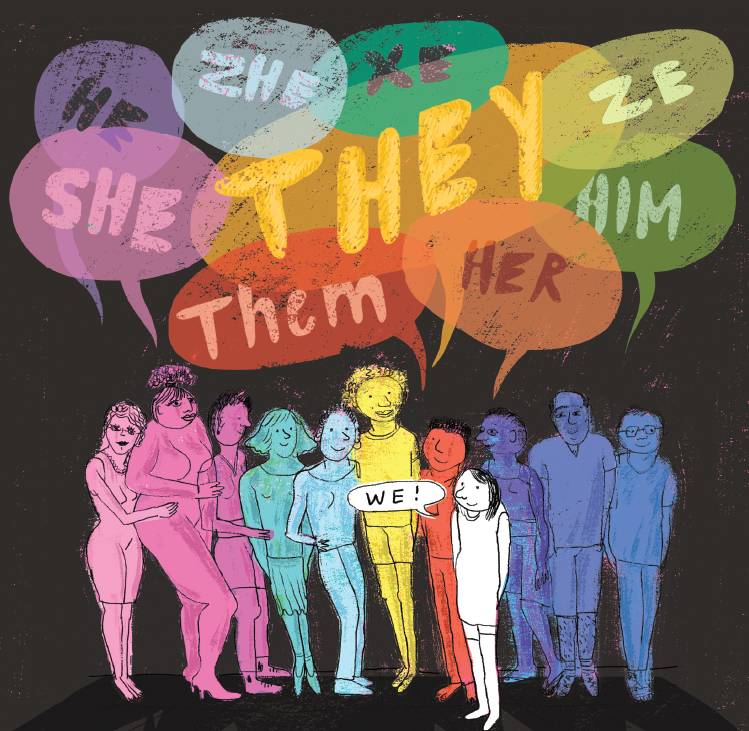 For people who identify as transgender, style guides and associations of journalists and health professionals advise use of the pronoun preferred or considered appropriate by the person in question. When dealing with clients or patients, health practitioners are advised to take note of the pronouns used by the individuals themselves, which may involve using different pronouns at different times. This is also extended to the name preferred by the person concerned. LGBTQ advocacy groups also advise using the pronouns and names preferred or considered appropriate by the person concerned. Why is it important to respect people's PGPs? You can't always know what someone’s PGP is by looking at them. 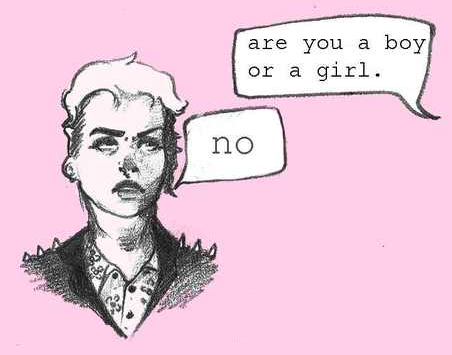 Asking and correctly using someone's preferred pronoun is one of the most basic ways to show your respect for their gender identity. When someone is referred to with the wrong pronoun, it can make them feel disrespected, invalidated, dismissed, alienated, or dysphoric. It is a privilege to not have to worry about which pronoun someone is going to use for you based on how they perceive your gender. If you have this privilege, yet fail to respect someone else's gender identity, it is not only disrespectful and hurtful, but also oppressive. 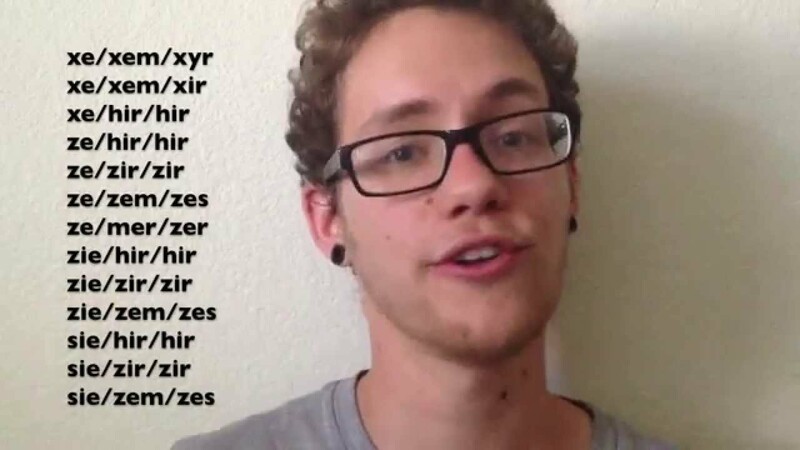 Ze and Hir are popular alternate pronouns that are gender neutral and preferred by some transgender people. Pronounced zee and heer, they replace “he” and “she” and “his” and “hers” respectively. 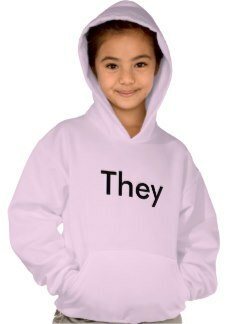 Alternatively some people who are not comfortable with and do not embrace he/she pronouns, may use the plural pronoun “they/their” as a gender neutral singular pronoun. Mx. is an alternate title for Mr., Miss, Mrs., or Ms. that is gender neutral and preferred by some transgender people. 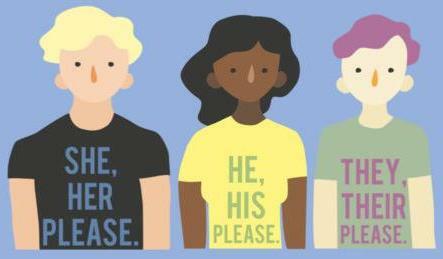 It should be noted that the use of preferred gender pronouns is just part of the overall effort to show respect to transgender and gender non-conforming people through the use of language. Using pronouns in conversation is typically a matter of talking ABOUT (making a reference to) a transgender or gender non-conforming person. While the transgender or gender non-conforming person may be within earshot of the conversation, generally they are not present. Candace Gingrich, HRC's Associate Director of Youth & Campus Engagement, says that "using preferred gender pronouns is less about extending courtesy than of practicing basic human dignity." 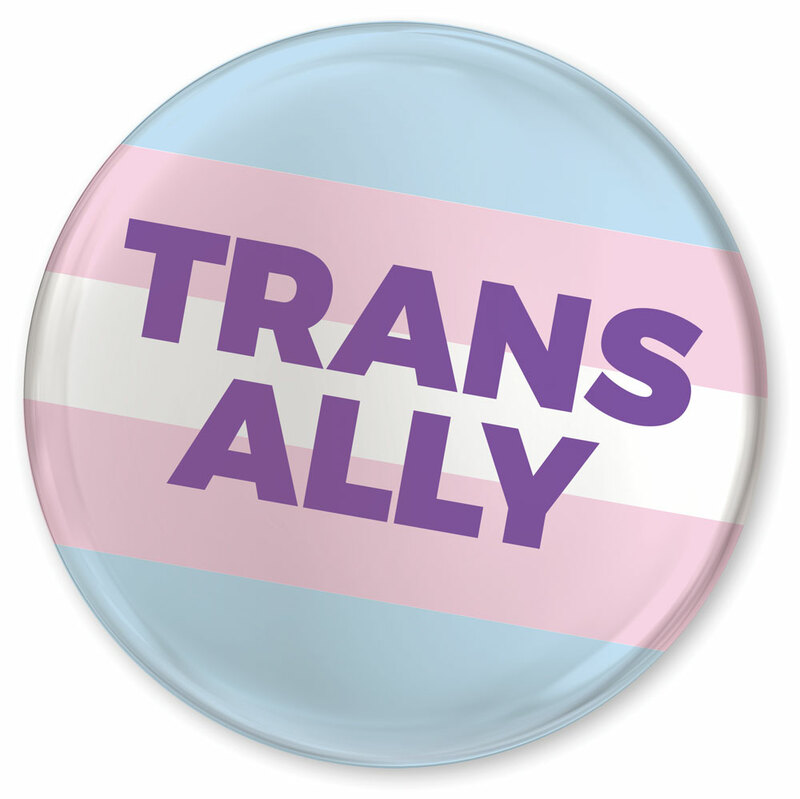 If you are part of an LGBTQ support group or a gay-straight student alliance, one way to make sure that you are being inclusive and welcoming for transgender or other gender nonconforming people is to incorporate PGPs into your regular intro activities. If you start every meeting by having those present share their names, ask them to share their PGPs as well. How would you like me to refer to you? Can you remind me which pronouns you like for yourself? 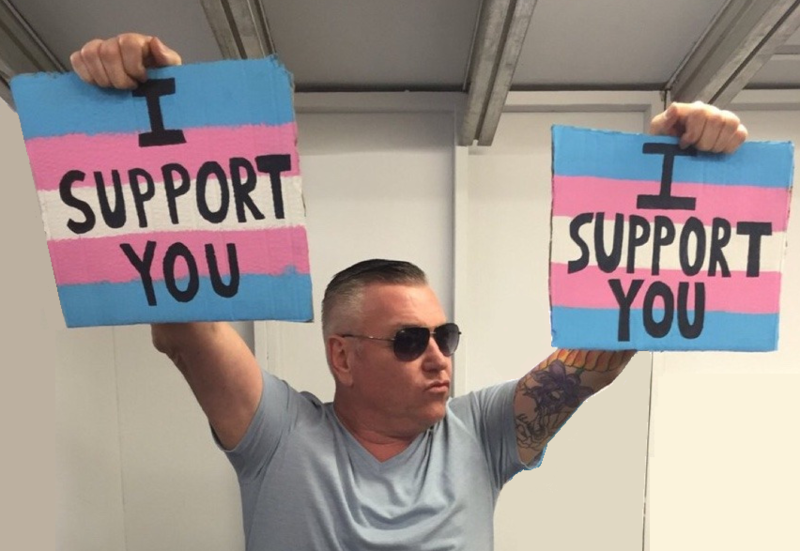 My name is Tom and my pronouns are he and him. What about you? Buttons and stickers are useful tools for groups to use. 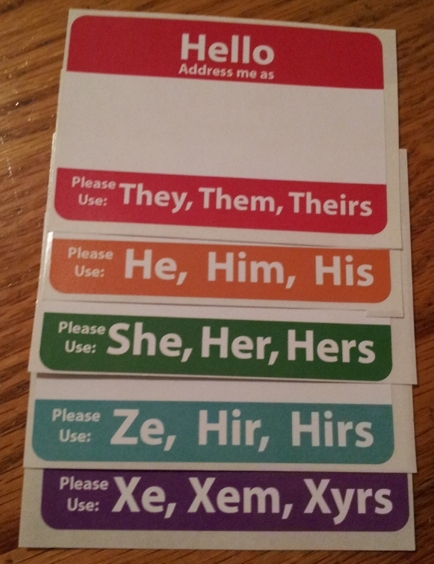 Name tags (the peel and stick kind) can be utilized at conferences, meetings, and social events to clarify pronouns. A note like this one could be included in the footer of an e-mail or business correspondence: "Self-expression and self-identification are among my professional and personal values. 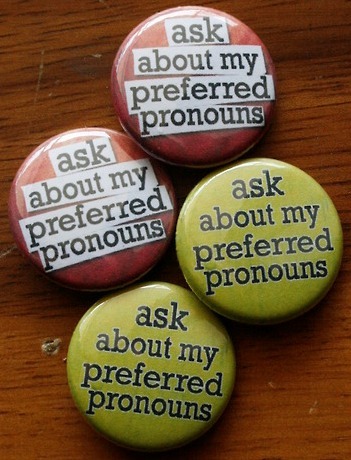 One way to practice these values is to share preferred gender pronouns. My name is Samuel and I use she/her pronouns. What pronouns do you use?"